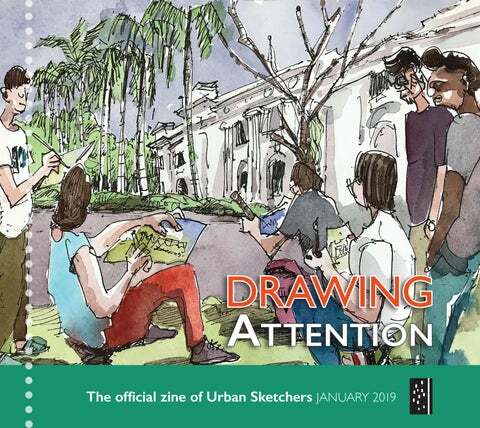 Drawing Attention Mandate Drawing Attention, the official monthly zine of the Urban Sketchers organization, communicates and promotes official USk workshops, symposiums, sketchcrawls, news and events; shares news about USk chapters; and educates readers about the practice of on-location sketching. Thanks to this month’s Drawing Attention contributors: Managing Editor: Patricia Chow Editorial Assistant: Pedro Loureiro Mailchimp layout: Jane Wingfield Issuu layout: Anne Taylor Writers: Leslie Akchurin; Mark Anderson; Meagan Burns; Pedro Loureiro; Sarah Minty. Proofreaders: Leslie Akchurin; Ann Schwartzwald. Contributors: Parka; Amber Sausen; Tina Koyama cover image: George Huang Subscribe to Drawing Attention. 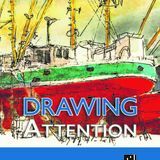 Read the December edition of Drawing Attention. Circulation: 11,001 Readership: 16k+ Web: urbansketchers.org Urban Sketchers is a 501(c)(3) nonprofit organization dedicated to fostering the art of on-location drawing. Click here to make your tax-deductible contribution via Paypal. © 2019 Urban Sketchers. PRESIDENT’S MESSAGE Dear Urban Sketchers, Before we jump into the new year of 2019, let’s celebrate for a moment all the things we accomplished in 2018. When I think about the past year for Urban Sketchers, it is the incredible talent and generosity of our community that stand out. In January, we relaunched Drawing Attention in a gorgeous new zine format. In May, you, the Urban Sketchers community, donated over $20,000 as part of the 10k+10k Matching Funds Campaign. In July, the 9th Urban Sketchers International Symposium was held in Porto, Portugal, with over 800 participants and a worldwide online following. HOW TO READ DRAWING ATTENTION AS AN E-ZINE FOR EASIER READING ON ISSUU.COM SELECT FULL SCREEN. A PDF VERSION IS AVAILABLE ON OUR WEBSITE. PLACE YOUR AD HERE MEET THE AMSTERDAM SYMPOSIUM CORRESPONDENTS At the end of a highly competitive selection process, three outstanding candidates were chosen to cover the Amsterdam symposium as correspondents: Mark Anderson (Liberty, Missouri, USA), Mariia Ermilova (Tokyo) and Gwen Glotin (Amsterdam). The USk Editorial Team and Executive Board are pleased to have selected a strong, committed team for the important volunteer role of reporting on the 10th annual USk Symposium. The Symposium Correspondents program, which provides travel and lodging to international correspondents and an honorarium to the local correspondent, was launched in 2011 in Lisbon. The program’s goal is to bring attention to the storytelling possibilities of urban sketching, especially in covering an event. “We appreciate the time and enthusiasm that all of the candidates put into their applications,” said editor Tina Koyama. Read more about the correspondents and see their sketches here. Click here for the program and instructors line-up and plan your sketching adventures in Amsterdam! Click here for registration details and Symposium news. one of the best places to sketch in Singapore might just be everywhere. The constant change is a subject unto itself. Check out the 20 minute Mediacorp video on USk Singapore here and Johor Kaki’s blog here. he first group of sketchers in New Mexico, USA, got together in 2012, unknowingly abiding by the USk manifesto. They had been sharing their art through Meetup.com, but because of membership charges, Barbara Wolff began looking at other platforms, like Wordpress. That’s when she came across the USk global community. “Gradually it all started getting more formal and, by word of mouth, people were slowly joining,” recounts Jay Leutwyler (left), one of the current admins of USk Albuquerque/Santa Fe. An art major in college, he became an accountant and bookkeeper, but is still a sketcher and watercolorist at heart. Based in Albuquerque, Jay shares his admin duties with fellow sketchers Zeke Browning and Barbara Wolff. Being two of the oldest cities in New Mexico, they have a lot to offer to eager sketchers. The downtown old plazas of Albuquerque and Santa Fe the latter founded in 1610 - are favorite sketch locations. “Albuquerque is infused with both Spanish and Native American Pueblo cultures. There’s also a big movie industry. A lot of Western movies are filmed in New Mexico.” In one of their most exotic outings, the chapter visited the old mining town of Los Cerrillos, which Jay exclaims, “looks almost like a Western movie set, with all the wooden buildings and saloons!” “Between Santa Fe, Albuquerque, and nearby Taos, there’s a large art community,” which results in 15 to 30 participants at every sketch outing. “We have this incredible light, this wonderful bright blue sky almost every day of the year.” Despite that, the weather in New Mexico still demands careful planning for sketch outings. Albuquerque is so high in altitude that harsh weather can become an obstacle. Jay makes sure to “plan ahead for the weather and pick flexible indoors/outdoors locations.” USk Albuquerque/Santa Fe meets every three weeks, and Jay plans out the schedule for the whole year in advance, picking the locations and choosing the best time of year for each location. The chapter is now planning their first public exhibition. “A local gallery contacted us about exhibiting our sketches in a simple, straightforward manner - just having them put up on the wall with no frame.” Jay believes it’s the perfect way to show urban sketches to the public, as laid-back works of art, accessible to all, and born out of the simple joy of sketching. “THE WIND CAN SOMETIMES BE FIERCE, BUT THESE ARE THE MOST WELCOMING PEOPLE YOU CAN FIND,” WILLIAM LENTZ TELLS LESLIE AKCHURIN. The Story You Tell SARAH MINTY MEETS INSPIRATIONAL INSTRUCTOR REHAM ALI. ll of my sketchbooks are scenes of my life,” says Reham Ali, who began urban sketching five years ago. Originally from Egypt, Reham now lives in Saudi Arabia teaching interior design at university. When discussing her approach to sketching, it’s all about the personal. “The connecting point between my sketches is me, my life…I don’t write about the architecture or the history of that place, I write my memories.” Storytelling was central to her workshop in Porto, as she taught students how to “capture people’s lives” when sketching the buildings. EMBRACING THE LIMITATIONS ARCHITECTURE PROFESSOR AND URBAN SKETCHER MATTHEW BREHM IS AN EVANGELIST OF THE ANALOG, DISCOVERS MARK ALAN ANDERSON. tudents of Matthew Brehm quickly learn that drawing on location means there’s no “Command Z” to fall back on. A self-described “evangelist of analog,” Brehm speaks with passion about how we use our hands, eyes, and minds to explore and develop ideas. He believes drawing can be a primary means of “loading our minds” about art and architecture, and in doing so using the act of drawing by hand as a way to more thoroughly absorb the world. “The more we learn about the world, the more able we are as designers to be informed in decision-making,” says Brehm. offer are often overwhelming, exacerbating an already limited attention span – a distraction he considers to be the enemy of mastery. “If you want to master something,” he says, “it takes a long span of attention. If at the very moment you start to get frustrated with something, you bounce to something else, that’s the moment you stop learning.” Matthew Brehm is Professor of Architecture at the University of Idaho. He leads an annual workshop in Rome, a city for which he has an abiding love and where he opens students minds to architecture, art, urbanism – and above all else, to learning how to draw. Urban Sketchers is currently seeking volunteers to fill the following position: â&#x20AC;¢	Volunteer Fundraising Director For more information click HERE. Teoh Yi Chie is an infographics journalist who joined Urban Sketchers Singapore in 2009. He is better known as Parka from Parkablogs.com a website that reviews art books and art products. This month Parka video reviews the iPad Pro 2018 with Apple Pencil 2. Check it out! Urban Sketchers organizes workshops taught by our top instructors in collaboration with USk chapters around the world. If you would like to bring an official USk workshop to your chapter, start the conversation with our Education Director, Mรกrio Linhares at education@urbansketchers. org. Our Manifesto •	We draw on location, indoors or out, capturing what we see from direct observation •	Our drawings tell the story of our surroundings, the places we live and where we travel •	Our drawings are a record of time and place •	We are truthful to the scenes we witness •	We use any kind of media and cherish our individual styles •	We support each other and draw together •	We share our drawings online •	We show the world, one drawing at a time.